Below I'm publishing a letter I've written to NOAA - National Oceanic and Atmospheric Administration. NOAA is proposing stringent guidelines that severely restrict or eliminate the ability to human beings to observe or swim with Hawaii spinner dolphins. Why? Because of speculation that human presence in their daytime resting areas, is compromising their health or causing a population decline. Current research does not validate this hypothesis!! See my letter below which sites five research studies and shares my informal observations after spending thousands of hours swimming with dolphins and observing the "scene" in our local bays. I encourage you to read this letter even if you've never swam with HI spinner dolphins. Our situation in HI is a great example of conflicts that arise between government authorities and individual communities whose wise residents know how to love and serve community members, serve the local environment and enhance the life force of their local ecosystems with profound wisdom. If you've never experienced swimming with wild spinner dolphins in Hawaii you can deeply and powerfully assist us in another very important way. Read Ashram of the Sea and the transmissions and activations offered in this blog. Connect with the avatar dolphins and whales who are the spiritual leaders in the Ashram of the Sea. Ask for their help in creating a win-win solution on behalf of Hawaii spinner dolphins, the humans who love them, the ethical businesses that profit from the "swim with and observe dolphins" enterprises and NOAA. Also send your comments to: lanny.sinkin@gmail.com. He is an attorney who is prepared to represent our community and he would like letters sent to NOAA to be also sent to him. Go to http://savedolphinswims.org/ . This is Doug Webster's website created to provide information on the HI "swim with dolphins" controversy. Perhaps email Doug your NOAA letter. I invite you to make comments about this matter in the comment box or on my Facebook page where I'll post this letter. Please read my entire LONG letter before doing so. Retreat leaders: I've included a one page write up a group of us developed a few years ago. We included input and wisdom from Trish Reagan, Doug Hackett and Joan Ocean on leading retreats in our South Kona community. This is so relevant to our current situation!! The dolphins and I appreciate your support! P.S. I took a walk in the woods of Colorado yesterday enjoying the beautiful fall colors. And Savina, an avatar Hawaii spinner dolphin, began to lead me into the message below. Her perspective will melt your hearts. This is a great opportunity to merge your hearts with Savina's heart. Next, I invite you to read my letter to NOAA. There’s a completion of what’s referred to as a paradigm shift taking place on our beautiful Golden Ground (Earth). The paradigm is a very complex paradigm that steeps you all in a new way of competing for attention. From your perspective, with regard to this problematic situation that NOAA has presented you with, you’ve got all the answers. From NOAA’s perspectives their organization has all the answers. From your local Hawaiians' perspective they definitely have all the answers. This, my friends, is the challenge of living here and learning how to peacefully co-exist. The harmonic of Polarity is the frequency of Christ Consciousness that HI spinner dolphins co-create with all of you! Perhaps this is new information to you. If so please read the book called Ashram of the Sea – received and translated by Kathryn Jensen. My consciousness is expressed in the book but the concept of Polarity is not covered in depth. I’d like to give you some information about Polarity. Spinner dolphins hold the frequency of Polarity within our fields. Our hearts and souls vibrate with this frequency so that we may better serve human beings with a deeper capacity for managing stress. Beloveds, that’s why we leap into the hearts of so many people with such intensity. Our arrangement with Gaia is that of establishing a cradle of safety for all of you. We do indeed guide people to visit us in our local waters. Some of you first met me, Savina, as you meditated on complex matters of the heart. I provided you with my calming yet heart awakened presence. I also provided you with a vision of my Hawaii homeland or should I say home waters. You found your way to HI so you could visit with me and my family. So our pod has co-created a bond with your pod that’s unknown elsewhere on Earth. More and more people are attracted to our local waters to visit with us. Our commitment to you needs to be clarified. Our Golden Ground (Earth)has intentionally co-created the frequency of Polarity with Hawaii spinner dolphins because she knew we had the right kind of ancestry. Our ancestors lived with the Lemurians. We helped the Lemurians assist broken ones who came to Lemuria to be healed. We lifted the broken ones into the healing frequency of Polarity which assisted them in feeling less fragmented. We collaborated fully with the Lemurian people in helping these people come back into a state of balance. Their planet was destroyed and they suffered from what is now called post-traumatic stress. In this day and age we provide a very similar service and that’s why participating in dolphin swim retreats or coming on your own to seek our presence in our local bays is so sought after. We love you and appreciate the way your hearts expand as you absorb all the love we have for you. Your government, however, has grave concerns about our health and well-being. Therefore you must take positive action to amend some of your behaviors. You must relinquish all fear that your presence in our resting areas is causing harm. We thrive on your loving presence as you thrive on ours. Sometimes, however, great numbers of people swim out to greet us and we do modify our behaviors. We’ll gather together in consultation and decide to swim to more peaceful areas of your local bays. We do know how to manage our central nervous systems. But when great numbers of people are in our midst and we need to rest, we distribute our consciousness in a modified manner. So you do not receive our gifts with as much clarity as you might if just a few of you were in our presence. We would like you to receive our gifts with more clarity. We suggest that you present yourselves to us in small groups of 15 to 30 people. To do this you would all need to reach a consensus on how to manage yourselves. Retreat groups leaders, boat captains and those who swim individually from shore must meet and formulate a plan for interacting with us. We know this presents you with immense challenges. If you do so you will gain the respect of your government officials. You will avoid their interference. We will be ever so much more capable of serving you with intimate love filled, heart centered healing. We adore your presence in our rest areas but do shift your commitment to fewer people entering our rest areas so we may flood your hearts with the Golden Ground's frequency of Polarity. We do this so you may serve yourselves with more of what you desire – peace, tranquility and the Golden Ground’s assistance in speaking to your guides. As you speak to your guides you will fill up with ever so much more confidence that you have the personal power to serve yourselves and others with love. I’m a resident of Captain Cook on the Big Island of Hawaii. I’ve been swimming in our local bays – Kauhako, Honaunau, Kealakekua Bays almost daily for approximately ten years. I’m an objective observer of the dolphin-human interactions in our local bays and am not in any way benefiting economically from leading people into or onto our local waters to experience up close encounters with dolphins. I’m currently on the mainland and cannot attend September 7, 2016 5:30-9:30pm Konawaena High School 81-1043 Konawaena School Rd, Kealakekua, HI 96750. As an alternative I’m writing this letter. Since moving to Hawaii, over ten years ago, I’ve attended nearly every meeting concerning the issue of protection of HI spinner dolphins and listened to concerns that human presence in our local shallow bays where spinners tend to rest during the day is a source of stress for the dolphins. I’ve done my best to extract the essence of various research studies on the human-dolphin relationship. I’ve done my own informal observations of the dolphin-human exchanges in our local bays as I’ve swam in the bays and observed from shore. · My experiences and observations spending thousands of hours swimming in the three South Kona Bays. Listed below is current list of potential restrictions regarding dolphin-human interactions. NUMBER ONE (1.) -- NOAA takes no action and leaves things the way they are. NUMBER 2 -- Swimming is prohibited with ds from shore and from vessels. This eliminates all commercial swim with dolphin activities (except for captive dolphins) If a dolphin approaches you, you must swim away. NUMBER 3 B - Same as 3 A above but the approach limit would be 100 yards instead of 50 yards. NUMBER ONE (1.) -- NOAA takes no action and leaves things the way they are, other options -Numbers 2-4 spell the end of the dolphin-human swim industry on the Big Island. In Captain Cook people come from all over the world to swim from shore with the desire to swim with wild dolphins. These visitors support the local hotels, bed and breakfasts, vacation rentals, retreat centers, restaurants, artists, swim guides, kayak rental businesses, guide services etc. This would be quite a blow to our local economy and it would be worth compromising our local economy if the research studies showed, beyond a shadow of a doubt, that dolphins’ health is being compromised or the population is in decline and this was absolutely conclusively due to human induced stress. I and others would rally behind these rigid guidelines for protecting these amazing spinners if we knew we were causing harm. Research: I’ve seen no research that supports this hypothesis. I’ve only read articles speculating that the dolphins are suffering from stress related issues because of the presence of humans and boats in the sheltered bays where they rest. Study One: I include this study because it’s a study that indicates it’s unknown whether or not vessel and swimmer traffic is affecting survival and fitness of survival and fitness of the dolphins. Study Two: I include this study because this study concludes that spinners do indeed rest in sheltered bays. The researcher notes that spinners are more likely to rest between 10am and 2pm. Time/area closures between 10am and 2 pm is not one of the possible restrictions listed. This is the most moderate suggestion with regard to time area closure. This would allow for a few hours of early morning swim time for humans who swim in dolphin rest areas which would cultivate awareness that dolphins swim in shallow bays to rest and must be left to rest from 10am-2pm. Public. Education, I feel, is the most viable solution to this issue. 3. When resting the spinner dolphins are more likely to rest over a sandy substrate (Figure 4). Study Four: I include this study because it emphasizes the need for public education on dolphin behaviors. Study Five: This research studies the impact of swimmers on dolphins in their shallow bays where they rest during the day. This is an inconclusive study that leaves much room for speculation. The research above is primarily speculative. It's abeginning. However, before enforcing strict rules that prohibit interactions between human beings and dolphins that will seriously impact our local economy and delete a source of incredibly joyful, healing life experiences for humans, we need proof that the population is declining and spinners' health and well being is compromised. It needs to be acknowledged that throughout time there’s been an extraordinary bond between human beings and dolphins. This is not mere conjecture so please NOAA dive into the psycho-spiritual-historical literature on the topic of the dolphin-human bond. Perhaps dolphins love to commune with human beings as much as human beings do with them. Perhaps the relationship is mutually beneficial. So with appropriate education of human beings the exchanges between human beings and Hawaii Spinner Dolphins can be created as undeniably, mutually beneficial relationship. I’m of the personal opinion that we need more information gleaned from more in-depth research. Most importantly, as stated above, we need to know if the population of HI spinner dolphins on the west coast of The Big Island is declining or suffering from stress related health problems. I put a * in front of threats that are, from my perspective, potential threats to Hawaii spinner dolphins. Many of the links below refer to roles NOAA’s National Marine Fisheries Service play in protecting the ocean and its inhabitants as well as challenges this organization has had in fulfilling these roles. In our area of South there's speculation that the tourist activity of swimming with wild dolphins is a threat. This letter provides links to research that does not support this hypothesis. As for issues do to boats that take people to swim with dolphins, that's a matter to be explored with boat captains. I only have experience swimming in the three South Kona Bays. Kealakekua Bay – The dolphins typically arrive in a shallow part of the bay in the early morning. In the early morning hours some dolphins are awake and very interactive with one another and with humans if they’re present in their swimming area. Others are in obvious rest mode as they swim and breathe in synchrony. The resting dolphins typically swim in wide circles totally ignoring human swimmers. At about 9 am most dolphins have slipped into rest mode and there’s no exchange between dolphins and swimmers. Also at about 9 am kayakers might be traversing the bay perhaps ½ a mile from the typical rest area. I’ve often seen the dolphins greet the kayakers and swim in their vicinity. The vast majority of local swimmers are well versed in proper dolphin swim etiquette. They respectfully stay in one location and dolphins make the choice to interact with them or not. Again if the dolphins are in rest mode they make a clear choice not to interact. Yes there are occasional uneducated tourists who attempt to chase and touch. Local docents like me take them aside and give them an gentle yet firm education. I’ve always – 100% of the time been thanked for the education I provided. At Kealakekua Bay we’ve had our share of Dolphin Nazis – our not so affectionate term for abusive people who “educate” people before they enter the water with verbal abuse, throwing rocks or signs degrading local retreat businesses or dolphin-swim charter services. Their presence is detrimental to humans and they certainly don’t provide useful education. At Kealakekua Bay I’ve seen retreat groups – mostly from foreign lands – escorting groups of 10-20 retreat participants into the water. Almost without exception these retreats are beautifully educating their participants in proper swim etiquette with dolphins. They typically situate themselves in one location often holding hands in a circle much further than the recommended 50 yard distance from the dolphins. Dolphins who are still awake, if they so choose, swim to the groups interact with them. The problem with the retreats I feel is the sheer numbers who show up on the shores of Kealakekua Bay. It’s disarming for local Hawaiians and locals like me to see so many people on our small local beach. Does this phenomenon hurt the dolphins? Not from my perspective! These retreat experiences create some of the most devoted stewards of our oceanic environment and the cetacean inhabitants. Shortly after 9am most swimmers are out of the waters, the dolphins are in rest mode and inaccessible to the average swimmers. Yes there are a few athletic diehard swimmers who persist in keeping up with the dolphins wherever they may go in the bay but the vast majority of swimmers are totally physically unequipped to do so. I’ve observed that educating people before they swim with dolphins is the best protection possible. I strongly feel that inappropriate Kealakekua Bay dolphin-human interaction would be resolved with basic education of uninitiated swimmers before swimming. This is a middle ground yet very effective solution to resolving the issue of potential stress being put on the dolphins due to human presence in their resting area. See the article mentioned above regarding the dolphin-human interaction on Oahu. This is the only article I found mentioning the value of education. Again the current research doesn’t warrant more drastic action of charging fines, court action, jailing violators ,closing the bays etc. Honaunau Bay – The dolphins typically enter this bay any time of the morning or afternoon. The waters are very deep and the dolphins, if they are awake, which is rare, interact with one another at depths perhaps 25-50 feet beneath the surface of the water. This is a popular snorkeling spot where tourists flock to observe life on the reef. Some come with the hope of seeing dolphins. Most have no clue about how be in the water with dolphins. So locals like me educate them. Again these tourists are grateful for advice about how to swim with dolphins. At Honaunau Bay the dolphins are typically in rest mode so we train people to float and watch the dolphin who are typically many feet below. Local fishermen use the bay to go out to sea and return from the sea. Any time area closure such as Tyne’s 10am to 2pm time/Area closure would be hard on them. The bay is narrow. So once more education, preferably before people enter the water is a powerful, effective alternative to fines etc. at Honaunau Bay which would be an enforcement nightmare. Kauhako Bay (Hookena) – The dolphins arrive in this bay at varied times throughout the morning. Like the situation at Kealakekua Bay, lively dolphins may choose to interact with swimmers. Resting dolphins don’t. I’ve stood on the overlook observing “the scene.” I’ve observed the entire pod of dolphins being in rest mode. They typically swim in synchrony in circles totally ignoring the cluster of human swimmers who may be in their resting area. They swim in circles whether or not humans are present in the bay. Even the most abusive, aggressive swimmer can’t possibly keep up with these resting dolphins swimming in synchrony in circles. Another fact that needs to be mentioned is that swimmers who swim in our South Kona bays can be out for a swim perhaps a mile or more from dolphins who are in the vicinity. Dolphins sometimes show up, out of the blue in those situations, initiating contact. Yes I know the guidelines instruct us to swim away and leave them. Well sometimes dolphins, who are extraordinarily intelligent, curious beings, choose to stay with us. This type of incident may be an argument for Number 4 Option listed above – closing the mentioned bays between 6am and 3pm. This option essentially deletes the privilege of swimming during the day in Hawaii’s local bays. Is that really an option? Of course not!!! 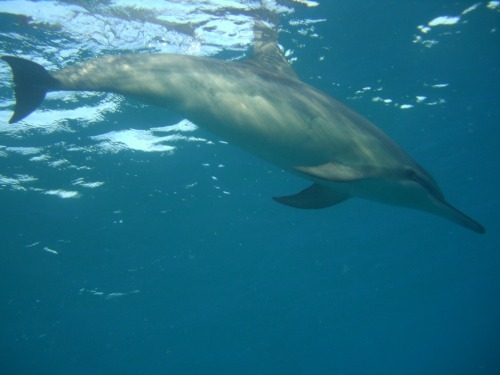 · There needs to be more research investigating the health of the spinner dolphin population on the east coast of the Big Island and in Hawaii’s waters in general. Current speculation that the health and wellbeing of the dolphins is being compromised by humans being present in their resting areas doesn’t justify eliminating the dolphin-swim-observation industry which is a vital part of our local economy. · Education is the ultimate solution to the challenges of dolphins sharing their rest areas with human swimmers. 3. Brochures left in local hotel rooms. · Those who experience swimming with wild spinner dolphins become the ultimate, passionate stewards of our oceans and cetacean species. Ultimately these people support NOAA and other environmental organizations in protecting all species of cetaceans. Our Hawaii spinner dolphins could be considered ambassadors for dolphin species everywhere and their human friends assist them in their ambassadorship. This, of course, is thanks to the unique opportunities currently offered in HI to view and swim with spinners. · We’re dealing with a unique situation in our community. Local Hawaiians are upset with the influx of tourists inundating the local beaches. The Hawaiians express anger towards local white people and retreat groups primarily from foreign countries who swim with dolphins and violate their cultural norms. We need to meet as a community and heal racial differences that result in anger being expressed by Hawaiians towards local police regarding “swim with dolphin” behaviors. I personally observe that complaints from broken hearted Hawaiians has a great deal to do with the current situation vs. the health and well-being of the dolphins. The Hawaiians are the primary group lodging most of the complaints about the situation on our local beaches. Many who work for our local police and DLNR are from well-established Hawaiian families. Please honor our unique cultural situation and give us time to problem solve our community issues in peace-our way. Study Hawaiian history. You’ll understand my message.